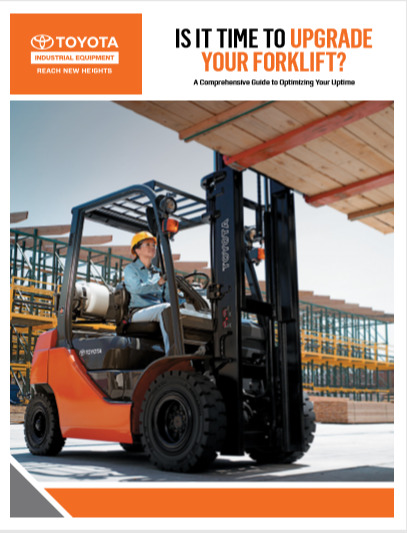 March 2nd, 2018 - Read these these tips on deciding when you need to upgrade your forklift. Enjoy a special $2,000 factory rebate if you trade in your forklift for a new one before March 31st! Contact us for more information on rebate eligibility! Everyone enjoys getting new things. Whether it is cars, phones, or computers we all want the newer versions of what we have. You may have had your forklift for many years and it still gets the job done. But your bottom line performance could be stronger. Not only is it nice getting shiny new equipment but it is also a good decision from a productivity and safety standpoint. So how do you know when to upgrade your equipment? Here are some things to think about. Has your truck had any hydraulic leaks, clogged fluid lines, worn chains, or battery problems? Prolonged heavy use of your forklifts can cause sustained maintenance issues. A forklift that is out of commission on your warehouse floor costs more than just parts and labor. The productivity loss multiplies the cost of downtime by several factors. An accident or injury caused by an outdated or poorly maintained piece of equipment can cause hundreds of thousands of dollars in damage. If there is an accident involving your outdated forklift you have to consider the cost from the damage to the forklift itself. You have to consider the worst case scenario which is an injured employee. Lastly you have to consider warehouse damage from the accident. Trading in your old forklift greatly decreases the chance of incurring those costs. Proactively planning the replacement of your equipment can make the process less stressful. Under average use, most forklifts will need to be replaced after about 10,000 hours of active use. For heavy duty and high use applications you may need to consider replacing after about 8,000 hours. Plan your replacement schedule around your application and consider the level of use of your forklifts. Still not sure? Let us come out to your location and learn more about your fleet.